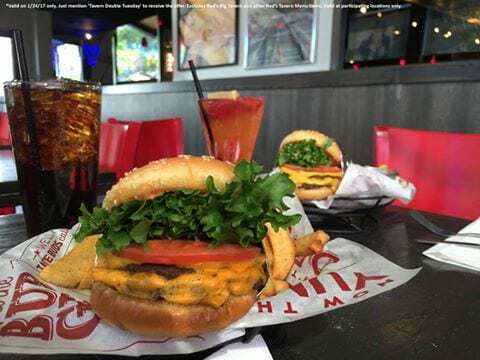 Free Red Robin Tavern Double Burger and Fries – Today Only! 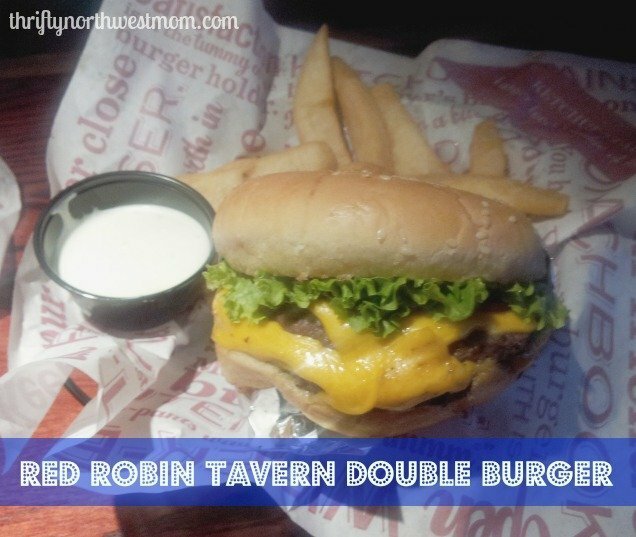 Free Red Robin Tavern Double Burger & Fries – Today Only! Red Robin is offering a special freebie, today only, if your looking for a fun place to eat. Today, Tuesday, March 5, 2019, they are offering a FREE Tavern Double Burger & Bottomless Steak fries, when you purchase any additional burger, entrée or entrée salad and two beverages. Just mention “Tavern Double BOGO” to receive the offer. Offer good for one free Red’s Tavern Double Burger or Haystack Tavern Double Burger. Must purchase an additional burger, entrée, entrée salad and two beverages to qualify. Valid on dine-in visits only. Not valid on online orders, to-go orders or delivery orders. Menu offerings vary by location. Excludes Big Tavern Styles. Free burger does not count as an item toward Red Robin Royalty and cannot be combined with any other offers. There are a few locations around the country that are not participating. It does not list any in the NW as being excluded, so it looks like we are good to go in this area. Find a list of excluded locations here. Make sure to sign up for the Red Robin Royalty Club to find out about awesome discounts like this in your area. We all dress up in our Seahawks gear to show our 12s pride during the game and blue Friday’s!! We love the Seahawks and show our support everyday with our custom WA Seahawks license plate SINCE 76! Go Hawks!! My favorite way to show my pride as a 12 is to wear my Seahawks jersey on Blue Friday! I like RR on Facebook! I subscribe to Thrifty NW Mom emails! I “like” the Red Robin Facebook page! I show Seahawks 12 pride, by dressing up in blue every blue Friday! Already a follower on instagram..
Like Red Robin’s Facebook page..
Our favorite way is to dress up the kids in their little Hawks gear, so cute! I like Red Robin on fb. I show my 12th man pride by watching all the seahawks games with my family! Since we all don’t have shirts but have a hat and sunglasses. Hubby and son wear it and I just kind a wear some blue and green shirt ???? Subscriber of the newsletter for awhile ???? now.. Followers of Jen and Sia on Instagram. ???? Been a follower of Red Robin on Facebook. ???? My favorite way to show my pride as a 12 is to dress my toddler up in his jersey to match his daddy! Everyone at my school dresses in Seahawks gear for Blue Friday. Going to the Jan 3rd game in AZ to show WA and Seahawks pride! I subscribe to TNWM emails! My favorite way is to deck the house out for match day! I’m following Jen and Sia on Instagram. I “like” Red Robin on Facebook. On game days, I always wear my Seahawks jersey with pride! I like the Red Robin Facebook page! I show my 12’s pride by getting my son a HUGE bag of Skittles for his birthday, as Marshawn Lynch is his favorite player. I like to show my live as a 12 by having friends and family over for games. I am always repping the team with my hawks gear! I show my pride as a 12 by cheering as I watch the Seahawks play and wearing their colors. !! Go HAWKS! I love being a subscriber to Thrifty NW Mom ! By cheering during the game! We love to wear Seahawks gear as a family! I subscribe to the Thrifty NW emails! Following Jen and Sia on instagram. The whole family wears our Seahawks gear! Of course I like Red Robin’s FB page, yum. I like the Red Robin fb page! I like the Red Robin FB page. I show my pride with large flags. I “like” the Red Robin Facebook page. My favorite way to show pride is by wearing my Sherman jersey and lucky Seahawks socks. My husband had a Wilson jersey, both were awesome gifts from his parents who we watch the games with. I liked red Robin’s facebook page. My entire family comes over all dressed in our hawks gear for dinner and football. We have license plate holders cheering on Hawks I have Hawks painted Jess’s. A ton of Hawks shirts. Face sticker tattoos. Even decorated my trunk for Halloween trunk or treat as 12th fan while wearing my letterman Hawks jacket!!!!???????????????????? We show our 12’s pride all year long, wearing hawks gear every Friday, Sunday, and game days! I work as a nurse and like to wear Hawks gear to work! Yes you’re correct, Kathy – it’s for the Red Zone touchdowns like last year, but not exactly the same as the items you need to purchase are different for this promotion. Thanks!